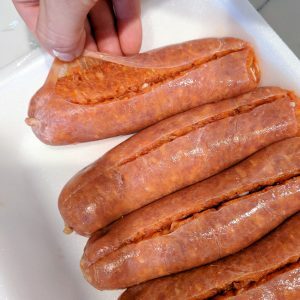 When I made my first recipe using sausage, I had no idea how to decase the sausage. Flash forward, I now use it in a ton of my recipes. Unless I am making sausage peppers and onions, I don’t like to keep the sausage in full links. Instead, I like to use the turkey sausage in ground meat form. 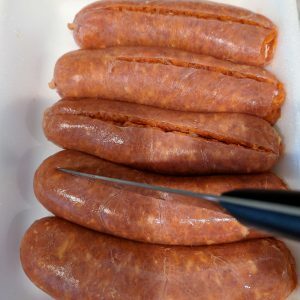 I have yet to find turkey sausage that already comes ground, so I make my own! My go-to brand is Jennie-O Hot Italian Turkey sausage. I use this in a TON of my recipes because of the flavor and for the fact that it is waaaaay healthier than regular pork sausage. Good ‘ol Jennie also makes a sweet Italian Turkey sausage if you can’t take the heat! (get yo *ss out the kitchen! – Coolio). 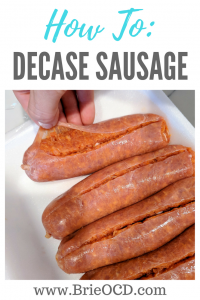 Here is how you quickly decase a sausage and make it into a ground meat to add flavor and protein to any meal! 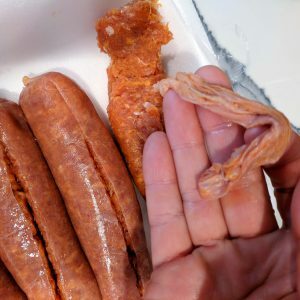 with the tip of a knife cut the sausage from one end to the other. using your thumb and forefinger peel back the casing. remove the casing leaving the sausage intact. repeat on remaining sausage. once casing is removed, start to pull the links into little chunks. Voila! 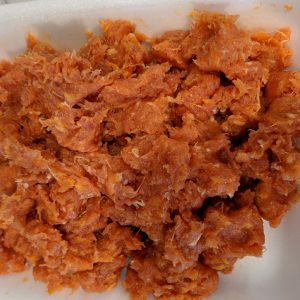 you now have ground sausage to use in your recipes!